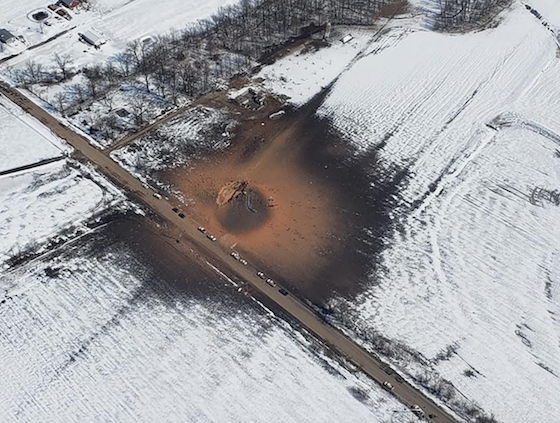 Aerial view of the blast site outside of Mexico, MO. A stress corrosion crack caused the massive natural gas explosion March 3 north of Mexico, MO, a new report found. The report, filed by Energy Transfer Partners with the Pipeline and Hazardous Materials Safety Administration, released April 2. Energy Transfer is the owner of the Panhandle Eastern Pipeline, which ruptured approximately one mile north of Mexico near Missouri Highway 15. The company had 30 days to submit a report to the safety administration. The 30-inch diameter pipe consists of carbon steel, with a specified minimum yield strength of 60,000 pounds per square inch. Pressure inside the pipe did not exceed the maximum allowable operating pressure. The investigation did not find evidence of human error or control room malfunctions. The widest part of the rupture was 94 inches and the entire rupture’s circumference was 864 inches in a pipe buried five feet underground. As a result of the incident, two people evacuated from the area, but there were no injuries or fatalities reported. One report had $1.14 million of property damage within the 621-foot potential impact radius. Highway 15 ended up scorched by the fire, which was 50 to 75 yards away. A house under construction by Matt and Shawna Penn was destroyed. Total incident cost — property damage and the estimated cost of the released gas — is $1.4 million. It is estimated that 91,719 cubic feet of natural gas released during the incident, which is slightly more than would fit into a standard Olympic swimming pool. This includes unintentional release and intentional blowdown of gas as valves to the line closed. An approximately 16-mile section of pipe was isolated and shut down between valve gates due to the rupture. The pipe used a supervisory control and data acquisition (SCADA) system, which was in operation and fully functional at the time of the incident and helped assist in the detection and confirmation of the rupture, according to the report. However, the rupture was initially identified by local operators.